'Doughnut' economics can help businesses move into the 21st Century. For any business that is searching for a 21st century compass, try this idea on for size. Let’s call it a 'Doughnut'. Its worldwide goal is to ensure that no-one is left in the central hole, falling short on life’s essentials, while simultaneously ensuring that human activity doesn’t overshoot the outer crust by putting too much pressure on Earth’s life-supporting systems. In other words, the aim is to meet the needs of all within the means of the planet. 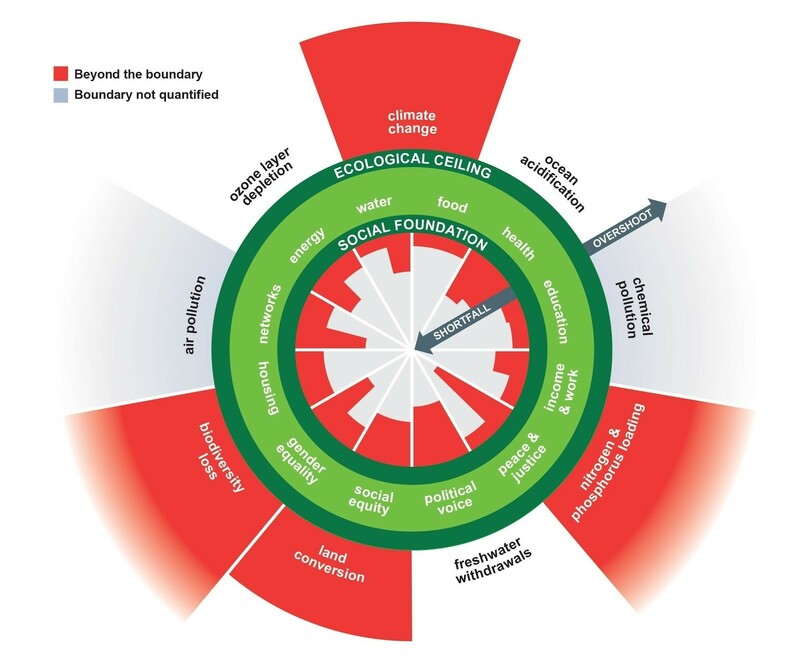 It’s an ambitious goal for our times because, as the red wedges show, we are currently transgressing both the Doughnut’s social and planetary boundaries: billions of people fall short on life’s essentials while we have already overshot at least four planetary boundaries. Moving into the Doughnut’s safe and just space is the challenge of our century. Over the past six years I have introduced this Doughnut diagram to a wide range of companies – from social enterprise startups to brand name multinationals – asking them what they plan to do in response to it. And I’ve been fascinated by the very diverse reactions it elicits. I call the five main responses set out below The Corporate To-Do List because it reveals the vast range of things that companies are ready and willing to do. ‘Yes, the state of the world is unfortunate, but the business of business is business, and since everything that we are doing is nearly legal, we’ll carry on until price or regulation forces us to change.’ This first response is of course the oldest but it has long passed its expiry date. ‘OK, we’ll cut our carbon emissions if it cuts costs, and we’ll get green certification if it boosts sales.’ This is a first step, yes, but its approach is far too incremental for the speed and scale of change needed. ‘We commit to matching national or science-based targets for cutting greenhouse gas emissions.’ Getting more serious now, but as anyone knows when left holding the restaurant bill after friends have chipped in for a big meal out, what we think is our ‘fair share’ rarely adds up to what’s actually needed. ‘We aim for net-zero carbon emissions and zero deforestation in our supply chains.’ Now that’s transformative. But why settle for being 100% less bad when you can break through the ceiling of imagination and start to do good? ‘The very way we do business sequesters carbon, cleans the air, pays living wages, and builds community – we’re here to make good things happen for society and for the living world.’ This, of course, is just the kind of enterprise that can help bring humanity into the Doughnut. 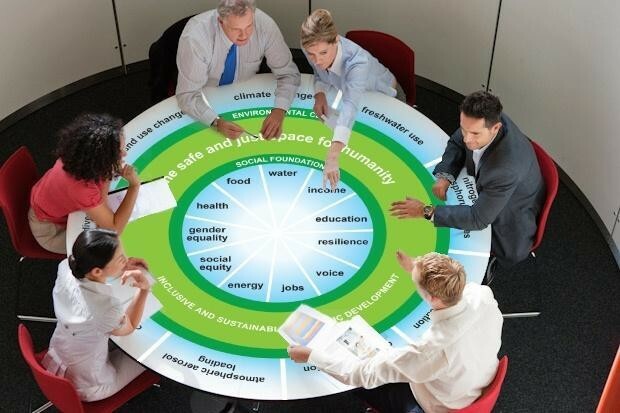 Can we do business within the Doughnut? These five responses cover a very wide range of reactions. The key question, of course, is what determines how far down this to-do list of transformation any particular company can or will go. Such powerfully opposing questions – one extractive, the other generative – reveal one of our era’s greatest psychological dramas: the ongoing transformation of what business is, and is for. To understand why, get on the psychotherapist’s couch and look deep within your company to see what really makes it tick. Because – as described by the brilliant corporate analyst Marjorie Kelly – deep in the heart of every business there are five key design traits that profoundly shape what it can do and be in the world: its purpose, governance, networks, ownership and finance. Five traits for corporate psychotherapy: which way are your company’s arrows pointing? First, what’s your business purpose? Is the company’s stated purpose a narrow financial one (‘We aim to be the biggest car manufacturer in our sector’) or a bigger-than-us, living purpose (‘Our aim is to make mobility sustainable’)? Purpose is key, of course, but it has to be backed up by the other four traits of enterprise design. Second, how is your business governed? What, for instance, are the metrics used to assess company and employee performance? A tight weekly focus on turnover, market share, and profit margins, for example, is likely to crowd out longer-term transformative action to cut carbon emissions and pay living wages throughout the supply chain. Third, how is your business networked? Who are its customers, suppliers and allies for change? Are they aware of and aligned with your business values and purpose, or are they caught in a business culture that works against them? And how can you turn those relationships around? Fourth, who is the business owned by? Whether an enterprise is owned by its employees, by a founding family, by values-based investors, or by the stock market will have far-reaching consequences. Why? Because how a business is owned deeply determines the answer to the final question. Fifth, what’s the quality of finance? Do the funders have that last-century focus on high and fast financial returns (acting more like share traders than shareholders), or are they committed to investing in social and ecological benefits along with a fair financial return? Finance may lie at the bottom of this list but, like most things in psychotherapy, what lies deepest drives it all. Taken together these five enterprise design traits reveal a good deal about why some businesses can help to bring humanity into the Doughnut, while others still profit by pushing us out of it. With these traits in mind, it becomes easier to see why some companies seem to behave like split personalities. Aspiring to do good in the world, they start by rewriting their purpose, and perhaps adjusting some of their governance metrics and networks to match. But if their ownership and finance remain unchanged then they will likely find themselves pulled in two. Perhaps that is just what happened to Unilever in early 2017. The company’s purpose – set out in its Sustainable Living Plan – clearly aims to contribute to a better world, and is backed by an ambitious set of measurable targets to measure progress in that direction. Unilever is also a member of business and NGO networks that call for strong action on climate change and water security. But when it comes to ownership and finance, the company is still largely owned by shareholders whose predominant question seems to be stuck in the last century: can I get a higher return, sooner? And it seems that this is what gave rise, in February last year, to the hostile takeover bid by Kraft Heinz and 3G Capital. 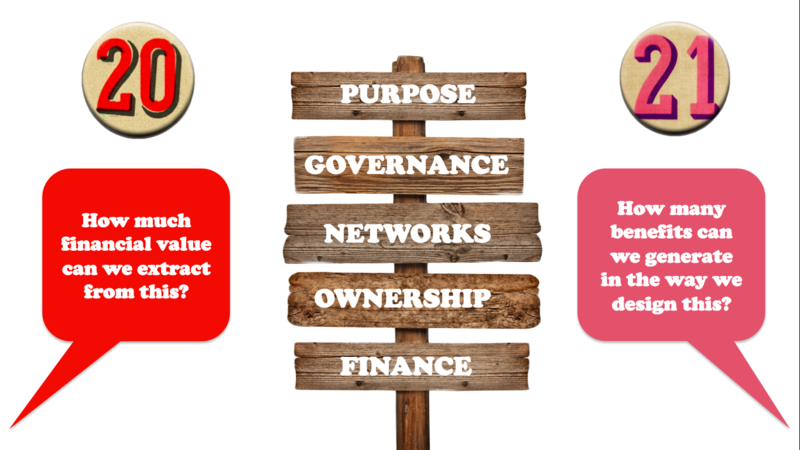 That bid was successfully fended off but the vulnerability remains – in a growing number of companies – of having purpose, governance and networks pointing in one direction, while ownership and finance pull in the other. To become a Doughnut enterprise – one whose core business activity helps to meet the needs of all within the means of the planet – it’s clear that companies need to align all five of these design traits, from purpose through to finance, so that they can deliver generative results. Which is why ongoing innovations in enterprise-ownership models and in values-based banking are so important. Time’s almost up for this session on the corporate psychotherapist’s couch, so let’s ask one last question: how do the current design traits of your business or enterprise hold back its ability to help bring humanity into the Doughnut? And what would it take to change that? Now there’s something to add to the to-do list.